Effective relief from respiratory diseases, scaly face and legs, and location change. Treats symptoms such as watery eyes, effortful breathing, tail bobbing, huddling and ruffling feathers, coughing, sneezing, and loss voice or song. Does not stain feathers. A safe and effective herbal treatment. Recommended for Canaries, Parakeets (Budgies), Love Bids, Parrots, Cockatiels, Finches, Macaws. Treatment of Respiratory Problems: Respiratory conditions in birds are of a complicated nature, and no one product can prove effective in all instances. Make certain that the cage is clean, warm and dry. Before use, VETRx™ should be warmed. To warm, loosen the cap, place the bottle in a pan of warm water. When all of the ingredients are dispersed, shake well. Mix one (1) teaspoonful of warm VETRx™ into one-half (1/2) cup of warm water. VETRx™ mixes with warm water, and floats on top of cold water. With an eye dropper drip two (2) drops of diluted solution into the nostrils. Do this twice a day for four (4) days. If this is difficult to perform, then, in its place, using the fingers, rub two (2) drops full strength under the wings. Do this twice a day for four (4) days. The body heat of the bird will vaporize VETRx™, and the bird will inhale the vapors. Put three (3) drops of the solution down the throat of the bird at night. Continue for four (4) days. Add two (2) drops (full strength from bottle) into clean drinking water once a day for five (5) days. Globules may rise to the top, they contain medication, and birds will often pick at it. Preventive Therapy: Keeping a bird healthy before sickness strikes is the owner's responsibility. Keep birds away from drafts and excessive cold or heat. Sudden drops in temperature can be a source of danger. All varieties of caged birds have sensitive respiratory systems. What begins as a minor cold or sniffles can evolve into a life threatening condition. Never position the cage close to windows, doors, heating ducts, fans, or air conditions. Make certain that the cage is clean and dry at all times, with clean litter on the floor. Try to change the drinking water often, and keep it at a moderate temperature. VETRx™ can help prevent sickness. Sprinkle a few drops of warm VETRx™ in the litter every five (5) days. Mix three (3) drops of warm VETRx™ in the drinking water each time it is changed. Once a week, rub two (2) to three (3) drops of warm VETRx™ under the bird's wing. Body heat will cause the aromatic oils in VETRx™ to vaporize into a medicinal vapor that will help keep nasal passages clear. Treatment: Scaly-legs and feet: Use VETRx™, at room temperature, directly from the bottle. Using a cotton swab, apply to scaly areas. Rub in well with a swab or fingers. Do this every day, once a day, for one (1) week. After the fifth or sixth day, scales should come off by themselves or with gentle hand rubbing. Thereafter, apply to the bird's feed and legs three (3) times a month. Avoid soaking the feathers. Scaly-face: Apply VETRx™, at room temperature, directly from the bottle. Using a cotton swab, apply two (2) times a day to the scaly area. Do this for five (5) days, an improvement should be noted. Use sparingly, and apply a thin film. Keep VETRx™ out of the bird's eyes. When the eyelids are involved, work carefully and slowly. The combination of pure lard and strong essential oils in VETRx™ will help to penetrate effectively to where the mites burrow into the skin. 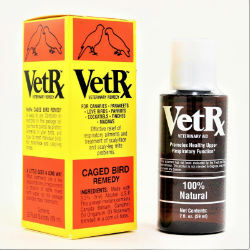 To discourage the presence of mites, rub perches with warm VETRx™ (full strength from bottle) two (2) times each month. Alcohol (v-v) 3.3% U.S.P., Canada Balsam, Camphor, Oil Origanum, Oil rosemary, Blended in a corn base.